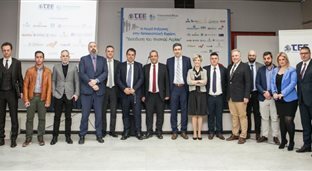 ELPEDISON sponsored ”The Energy Market in Southeast Europe Penetration of Natural Gas", which was held on March 7th at TEE Central and Western Thessaly. The conference, organized by the Energy Community of South East Europe, was attended by energy market operators and companies, where they presented alternatives for the transportation of Natural Gas to areas where they were previously not accessible by the Natural Gas Network. On behalf of ELPEDISON, Mr. Alexandros Mavridis, Director of Sales of Northern Greece, participated as a speaker.